Pioneers in the industry, we offer german chain hoist from India. These Chain Hoists are 100 percent German Made. They are manufactured by ABM Greiffenberger. ABM is one of the leading manufaturers of Hoist drives and Chain Hoists in the world with over 500 Million dollars in revenues recorded last year. ABM's Chain hoist are sold world over by companies like Hadef and Abus etc (ABUS is the largest industrial crane manufacturing company in the world in terms of numbers) and are comparable in quality with hoists supplied by the world best suppliers like Demag , Kone and Stahl etc. Additionally, the chain we use is from Rudd Germany or Pewag Austria. These are the best quality chains in the world. 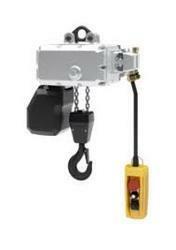 Looking for Chain Hoist ?